In the precious metals sector, we have pivoted slightly with respect towards the expectations of another leg lower in the short term. This is primarily based on the momentum structures in silver as they appear to be setting up for another bounce. 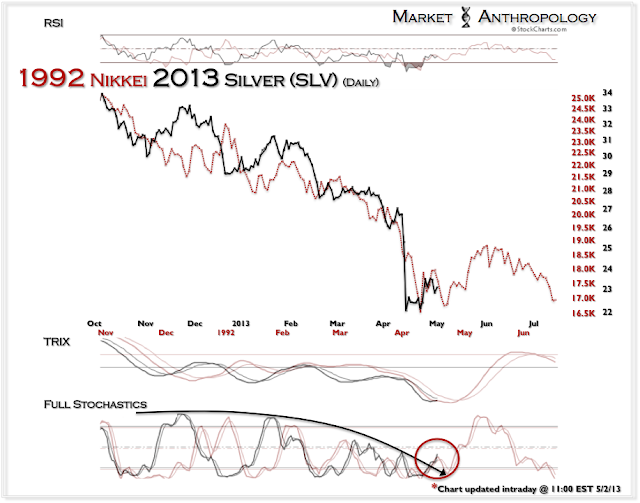 Not surprisingly, this also dovetails into our historic Nikkei comparative with silver. The long and short of things - the risk/rewards for overstaying our welcome here on the short side has shifted. While silver may weaken over the next few sessions and test the April lows - we are shifting our bias towards a larger countertrend bounce through May.